If you have any trouble displaying this e-mail or viewing the images, you can click here to view it online. Our first interactive online event has been scheduled. BUT are STILL STRUGGLING with your child's behavior? Want to stop yelling, arguing and handing out consequences that don't work? 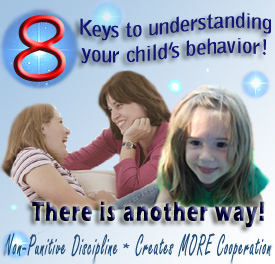 Learn the core principles behind conscious parenting and non-punitive discipline! This informative, interactive webinar is your introduction to a new family dynamic. One that is based in love and builds cooperation naturally! Join us for this FREE introductory online parenting class and change the way you look at parenting forever! Do you have a parenting question that you MUST ASK? Q&A's will be posted on the Examiner.com or via FB VIDEO on WEDNESDAYS. Now you can get real advice AND contribute to helping others by sharing your parenting struggles. Help me to help others by asking your toughest questions about parenting and discipline! Now using VIDEO to interact with you online! Trouble viewing this video? Click here to watch online! Supernanny had her say, now it's time to tell The OPRAH SHOW about conscious parenting & non-punitive discipline. Submit your e-mail to OPRAH and tell her why the revolution to TEACH through Love is important to YOU! How are you feeling? Fine, good, okay? When our kids respond like this, it doesn't tell us much, does it? Expand your emotional vocabulary!